Covers safety equipment, protective clothing, and procedures applicable to the cutting and welding of metals. Explains the safety requirements for oxyfuel cutting. Identifies oxyfuel cutting equipment and setup requirements. Explains how to light, adjust, and shut down oxyfuel equipment.Trainees will perform cutting techniques that include straight line, piercing, bevels, washing, and gouging. Explains plasma arc cutting equipment and safe work area preparation. Identifies correct amperage, gas pressures, and flow rates. Covers plasma-arc cutting methods for piercing, slotting, squaring, and beveling metals. Explains how to store equipment and clean the work area. Describes air carbon arc cutting equipment and processes. Identifies the electrodes and safe operation of the equipment. Provides step-by-step instructions for performing air carbon arc washing and gouging activities. Describes how to clean and prepare all types of base metals for cutting or welding. Identifies and explains joint design and base metal preparation for all welding tasks. Describes SMAW welding and welding safety. 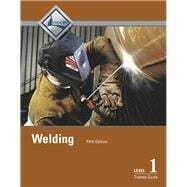 Explains how to connect welding current and setup arc welding equipment. Identifies and explains using tools for cleaning welds. Explains electrode characteristics and different types of filler metals. Describes the role of the American Welding Society (AWS) and the American Society of Mechanical Engineers (ASME). Explains proper storage and control of filler metals and identifies the use of codes. Describes the preparation and setup of arc welding equipment and the process of striking an arc. Explains how to detect and correct arc blow. Describes how to make stringer, weave, overlapping beads, and fillet welds. Identifies and explains job code specifications. Describes use of fit-up gauges and measuring devices to check fit-up and alignment and use of plate and pipe fit-up and alignment tools to properly prepare joists. Explains how to check for joint misalignment and poor fit. Explains groove welds and how to set up welding equipment for making groove welds. Describes how to make groove welds with backing. Provides procedures for making fl at, horizontal, vertical, and overhead groove welds. Explains open v-groove welds and how to set up welding equipment for making open v-groove welds. Provides procedures for making fl at, horizontal, vertical, and overhead open v-groove welds.